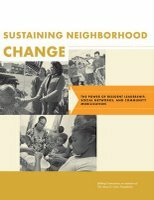 The guide provides good examples, short case studies, and resource lists for growing these approaches based on the work of communities participating in the foundation’s Making Connections Initiative. As importantly, the guide provides help in measuring Authentic Demand along a set of indicators for six outcomes for community members and community-based organizations: voice, accountability, identity, reciprocity, choice, and skills & capacity. The Annie E. Casey Foundation presents the ideas within the context of their work to improve the lives of children and families living in tough neighborhoods. However, the ideas are easily translated to other organizations, whether your work is about resident engagement as an end unto itself, or as an important part of a strategy around health, arts, education, or other fields. I found the guide an important addition to the growing set of ideas in the field on measuring community building and citizen participation work. It could also serve as a good overview reference for staff new to supporting and evaluating that work. What other great guides have you seen? Would it be useful to have all of the ideas on indicators listed in one place? In interest of transparency, one of my clients is the Annie E. Casey Foundation though the foundation did ask or pay me to write this post. The post is cross-posted at Big Thinking on Small Grants, a great blog by Janis Foster, the executive director of Grassroots Grantmakers. Great first blog! I haven’t read the Anne E. Casey Foundation report, but from your detailed review it appears to me that the same basic precepts apply to all organizations which rely on community acceptance for success. Notably, utilities, highway projects, educational programs and other groups need to understand the dynamic for grassroots acceptance.